Penn State athletics has seen its recruiting budget increase by over 80 percent according to a recent report by ESPN.com. The trend -- across the entire Big Ten conference -- shows that of more and more money being poured into the scouting and recruiting of high school athletes. This increase in spending at Penn State has happened in only a few short years according to the report. In 2008, Penn State spent $935,563 on recruiting across all athletics. By 2013, the athletic department's collective recruiting budget had rocketed to nearly $1.7 million. The 81.2 percent increase is the largest budget change throughout the conference over that span with all but one Big Ten athletic department reporting increased spending. Maryland reported a 9.2-percent decrease in recruiting expenses. Ten of the conference's member schools saw their budgets increase by over 20 percent with Nebraska's 65 percent change the next closest to Penn State's mark. So who gets the most money? 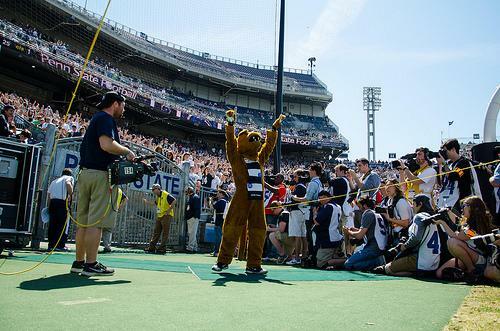 In the Penn State Athletic Department's most recently released financial report, Penn State football had spent $736,739 on recruiting alone, a figure nearly three times larger than it was in 2011. Men's basketball is second on the most recent recruiting budget with $305,987 and men's hockey comes in third with a $33,541 spent on recruiting talent to the school's newest program. While needs change year-to-year, the difference between the recruiting budget under Joe Paterno and Bill O'Brien is simply a reflection of their different approaches to recruiting as a whole. While Paterno relied largely in the final decade of his career on his name alone, O'Brien can be credited for modernizing the recruiting philosophy at Penn State as much as he can be credited with keeping the program afloat. Despite the massive increase, Penn State still falls well within the range of the rest of the Big Ten conference when it comes to overall spending. In fact, in 2013 three athletic programs were spending more money on recruiting than Penn State. Michigan led the way with $1.9 million with Nebraska and Ohio State not far behind. We'll have to see how recruiting spending grows under new head coach James Franklin. Franklin's intensity on the recruiting trail has been an intriguing watch, but that isn't a guarantee that additional money will be spent. Interestingly enough, men's hockey coach Guy Gadowsky has said he hopes to decrease his recruiting budget once the program has become more established. That's a unique plan in a world where money is often the life blood behind any successful team.